Q. Arlene in Silver Spring, just outside of DC writes: "I hate to bother you, but I'm getting so much contradictory advice. I was gifted with a raised bed on legs, perfect for my achy 80-year-old bones. Should I fill it now or wait until Spring? This is my 'year of compost'. Made it according to your recipe of chopped leaves and coffee grounds last Fall, and now it is gorgeous and abundant. I will use as much as you advise to fill my new bed. What else should I add to provide the most nutritious growing medium? And when? The raised bed on legs is 24" wide; 48" long, 30" high, and holds five and a half cubic feet of growing medium." A. Well, first of all, it's no bother. Without people like you asking great questions there wouldn't be a show! Anyway—congratulations on your compost success! And thank you for bringing the topic up at this time of year—when gardeners in the land of deciduous trees should be doing exactly what you did last year: using a leaf blower set on reverse (the 'vacuum/mulching' mode) or a bagging lawnmower or other device to collect and shred as many fall leaves as possible. Those shredded leaves are the primary ingredient in the making of high-quality compost. Important Point #1: Yes, they must be shredded or it will take many years for them to become compost—and if you only collect whole leaves every year you'll quickly run out of storage room. Shredded leaves, on average, take up one-tenth the space of whole leaves. Important Point #3: Do not 'layer' your compost ingredients; mix the grounds or manures in as you shred and pile your leaves. If you isolate the ingredients, composting will be delayed. 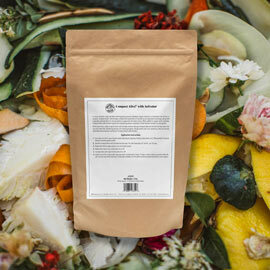 Important point #4: Forget most of the other ingredients that some composting sources advise adding. Junk mail and newspaper has zero nutritional value. Grass clippings from a chemically-treated lawn can kill garden plants even after complete composting—and those clippings should always be left behind to feed the lawn. Kitchen garbage can attract mice, rats, racoons and other vermin; and it contributes very little to the finished compost. Shredded leaves alone make better compost than leaves plus a lot of garbage. And now, back to the actual question. In general, it is better to use last year's finished compost now than to let it sit. Winter rains and snow will leach nutrients out of the compost, and if it's just sitting in a big open pile, those nutrients will be wasted. 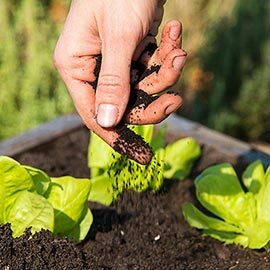 Yes, there will still be some loss if the compost is spread on garden beds or used in containers now, but some of those nutrients will remain right where you want them. To maintain the highest level of nutrients, cover the spread compost with one to two inches of shredded leaves. Compost that's contained in a sealed bin or tumbler is not going to suffer the same losses, so that can be left until spring. You can also store finished compost in big trash cans, but leave the lids ajar to allow a little air in. You could also cover the pile with a tarp—but only if the tarp is supported by a wire cage or something similar. 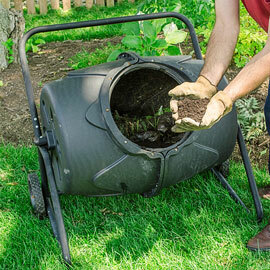 Avoid smothering the actual compost or it might get moldy. I think that Arlene—remember Arlene?—should fill her groovy bed on legs now with a combination of a soil-free mix (aka potting soil or seed starting soil; look for a quality brand that does not contain the Miracle of added chemical fertilizers; natural fertilizers are A-OK), her compost and some perlite. The exact ratio is going to depend on the size of the bags of perlite and potting soil she can find this late in the season—but roughly half compost and half soil-free mix plus some extra perlite would be ideal. If she's not going to use the bed until Spring, cover it with something solid, like a big piece of plexiglass, foam core or that sheet of metal you've been praying to find a use for someday. If you use a tarp, don't fill the bed all the way and use bricks at the corners and under the center to try and keep the tarp from becoming too smothering. Install three of those live rosemary Christmas trees you see in supermarkets and garden centers this time of year. Decorate them with small incandescent lights and the extra warmth will probably keep the semi-tender plants alive until Spring. Or pansies—the edible, super-cold hardy flower whose season is September through July. Maybe even try a late run of salad greens! Sow the seeds, cover the top with something solid, check it every day and remove the cover when you see sprouts. With some luck, you might be picking a fresh Christmas salad!